Scott Agnew makes his way into the Airdrie box. East Fife will be nothing if not prepared for the visit of play-off rivals Montrose when the two meet in League One’s game of the day on Saturday. A home win for East Fife at Bayview will see them take a huge stride towards confirming their place inside the top four. But a victory for Stewart Petrie’s side would put them in the driving seat. 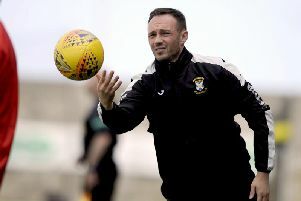 Fife boss Darren Young is leaving nothing to chance, and will have his side as prepared as they can be for the crucial fixture. The Fife boss said: “We’ve done well against them this season. “We’ve watched a lot of their highlights recently and know what they’re all about. “They’ve been doing well and probably nicking the odd goal here and there. “But it’s up to us to go and break them down and put in a really good performance at home. Airdrie, one of the other sides chasing the Fifers, were unable to make their home advantage count on Saturday, East Fife holding them to a 0-0 draw. The Fifers had the better of things throughout the 90 minutes, with shots off target hitting double figures. “I thought we did really well; I was delighted with the performance,” said the manager. “It was important we kept a clean sheet but a bit frustrating we didn’t get the goal that we deserved. “Overall we were comfortable and, I think looking back over the past three weeks, we’ve played pretty well.